Slavonia is a fertile plain that lies east of Zagreb between the rivers Sava and Drava. The region is distinctively flat, with thick forests meeting vast vineyards. It is quite well-known for its wines, and also produces corn, wheat and sugar beet. Slavonia’s culture is set apart from most of Croatia, as it was a Turkish territory until the early 18th century. Not being a coastal region, it is still largely undiscovered by tourists. As a result, it has preserved its traditions and its distinct character, especially in the villages. Horse-drawn carriages, folk costumes and traditional musical instruments are common sights here. During the Croatian Homeland War, the region’s administrative and financial centre of Osijek was devastated. Many important buildings have been significantly restored, but many Croats cannot easily forget what the city endured. 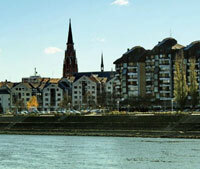 Osijek sits on the right bank of the Drava River in eastern Croatia. It is the region’s largest and most important city, and Slavonia’s administrative and economic centre. The city was shelled during the Croatian War of Independence. While many buildings have been restored, some still bear the evidence of shelling. The city consists of Upper Town, Downtown, and Tvrđa, the 18th century Habsburg fortress area. Tvrđa is a magnificently preserved compound that includes an Austrian palace. At night, it turns into a hotspot as bars and clubs open for business. Secession-style buildings line the avenue that leads from the fortress to Upper Town. 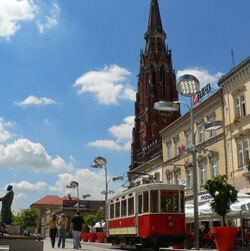 Osijek is also Slavonia’s centre of learning and culture. Major institutions include the Croatian National Theatre, the Museum of Slavonia, and the J. J. Strossmayer University. Important cultural highlights are the Croatian Tambura Music Festival in May and the Osijek Summer Nights, a series of open-air food and entertainment events running from June to August. Osijek is also known for its fine wines and cuisine. The city has two popular green parks, the English-style King Tomislav Gardens and the French-style King Petra Krešimir Park. Another favourite leisure site is the promenade along the riverbank. Along this long walkway are cafés, bars, parks and the marina. The city also has many sports halls and grounds. 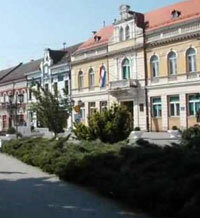 Đakovo lies on a plateau in the fertile region of Slavonia. Just like other towns in the region, it is surrounded by lakes and forests. Farming, livestock breeding and wool and leather processing are the primary occupations here. Major industries are food processing, textile, and furniture. The provincial town’s most impressive building is the 19th century neo-Romanesque Cathedral of St Peter and Paul. It is the most important sacral building in Slavonia. Its construction is credited to Bishop Josip Juraj Strossmayer, one of the greatest figures in Croatian history. Đakovo has a long and highly regarded horse-breeding tradition, centred in Ivandvor. The famous white Lipizzaner horses are the attraction here. In the past these noble creatures were ridden in the battlefields, but now they are an elegant spectacle in harness racing and classical dressage. The town attracts a few tourists who come to check out local wines, cuisines and folk festivals.